Extension of sandal goodness to body talcs. The only Talcum powder containing pure natural sandalwood oil, Mysore Sandal Talc is a gently fragranced talc that keeps you fresh and fragrant all day use of Sandalwood talc not only keeps you smelling great but its long lasting fragrance provides extra comfortable feeling on the skin all day long. Also you derive the benefits of Natural Sandalwood oil. Mysore Sandal Talcum Powder is now available in convenient and pretty packs. Karnataka Soaps & Detergents Limited, makers of world famous Mysore Sandal Soap in 1916 was established by the then Maharaja of Mysore. A legacy of over 100 years, Mysore Sandal Soap is the only premium quality soap formulated using pure vegetable oils base along with 100% pure natural Sandalwood oil and is known for it's great anti-aging and skin nourishing properties. Along with enticing sandal wood notes, the soap is formulated using essential natural oils like Vetiver, Patchouli, Geranium, Palmarosa, Orange and Petitgrain. The company has a wide range of enriching skin and body care products and cosmetics that keep your skin glowing, forever young and beautiful! Explore the entire range of Talcum Powder available on Nykaa. 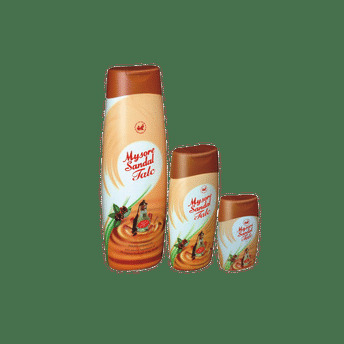 Shop more Mysore Sandal products here.You can browse through the complete world of Mysore Sandal Talcum Powder . Name of Mfg / Importer / Brand: Karnataka Soaps and Detergents Ltd.